From the breathtaking Gulf Views, down to the sun filled, beachy decor -"Sol Mate" is perfect for that family vacation on the beach. This is a beautiful resort style 3 bedroom, 3 bathroom condo and comfortably sleeps up to 8 guests. The master bedroom has a king bed and sliding glass doors which open up to the large covered balcony overlooking the Gulf of Mexico. There are 2 guest rooms one features a queen bed; the other, 2 twins. Both guests rooms have a balcony with views of the Navarre sound. Relax in the spacious living room and enjoy a beautiful sunset from the Gulf Front balcony. Beach Colony offers many amenities such as the largest pool on Navarre Beach, a tennis court, and fitness center -- all for you to enjoy! 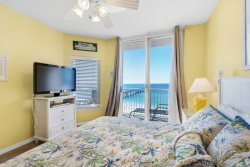 If you are looking to get your toes in the sand and relax in comfort and style, Beach Colony 5D is for you! This condo requires a Saturday to Saturday reservation during Spring Break and Summer. Everyone was GREAT and treated us well ! NP is always helpful and professional ! It is a very nice unit ! It is comfortable and has everything one would need. We are all set for next year and are looking forward to coming back ! Petra is the best! Sarah & Derrick also helpful. Appreciated Hunter w the beach chair rental. We stay w Navarre Properties due to exceptional service from Petra over many years. Her concern for a quality experience for your guests is a high standard. Greatly appreciate the return guest discount. It does help us spend more w local restaurants, etc. Sea you next April! The room was okay, just a little on the use side. The furniture was old the bed in the master bedroom was terrible. we moved to beach colony because we thought we were upgrading, but our stay at summer wind last year was better. --Manager's Response-- Thank you for bringing this to our attention. The owner takes pride in making sure their condo provides you a pleasant atmosphere. They are purchasing new furniture and making other upgrades for future renters to enjoy the new fresh new look. The property was beautiful,very clean, the kitchen super equipped, we ate out all the time,so we didn't use much of the equipment. Also it was just the 2 of us in a 3 bedroom, 3 bath condo.